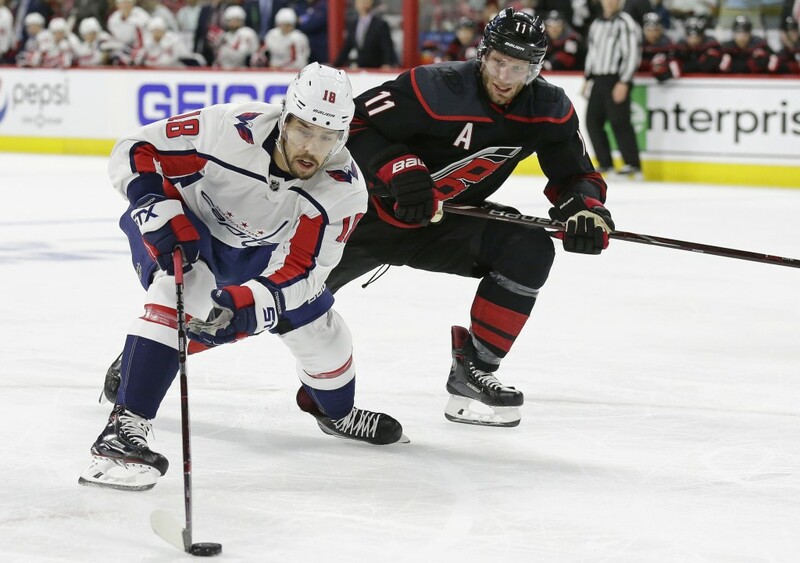 RALEIGH, N.C. (AP) — Rookie forward Warren Foegele had two goals and an assist, Petr Mrazek earned his fourth career postseason shutout and the Carolina Hurricanes won their first home playoff game in a decade, routing the Washington Capitals 5-0 on Monday night. 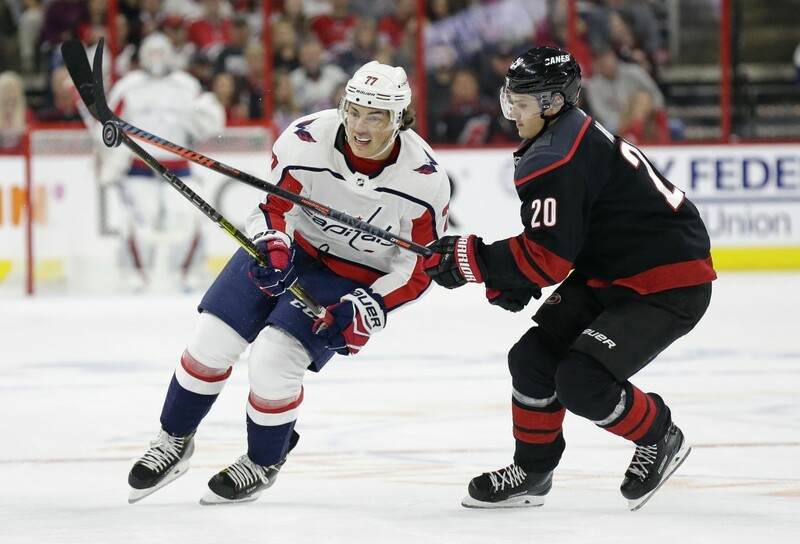 Dougie Hamilton also scored two goals, Brock McGinn had a late goal and an assist and Jaccob Slavin had two assists as the rapid-fire Hurricanes outshot Washington 45-18 to cut the defending Stanley Cup champions' lead to 2-1 in the best-of-seven series. Playing with just 10 forwards after losing two to injuries in the first period, Carolina effectively rolled with three lines the rest of the way and fed off an amped-up crowd releasing 10 years of pent-up frustration with every hit. Mrazek finished with 18 saves in his fifth career playoff victory — the last four have been shutouts. Braden Holtby stopped 40 shots for Washington, which had its six-game postseason winning streak snapped. The Capitals were shut out in the playoffs for the first time since 2017. They won all four regular-season meetings with their longtime division rivals — first in the old Southeast, now in the Metropolitan — before winning the first two games of this series on home ice. The first postseason game in Raleigh since 2009 — when Carolina was swept by Pittsburgh in the Eastern Conference final — was a physical, borderline violent affair, headlined by Alex Ovechkin's first career playoff fight, one that sent Hurricanes rookie Andrei Svechnikov's head crashing onto the ice and knocked him out of the game. Svechnikov was one of two Carolina forwards to sustain upper-body injuries in the first 10 minutes — physical winger Micheal Ferland was hurt about 2 minutes earlier — and that left the Hurricanes' bench short for the final 2½ periods. There was nothing at all wrong with Foegele, who had his team's first two-goal postseason game since Eric Staal in Game 4 against Boston in the second round in 2009. Foegele's first goal was a bit of a fluke — he was locked up in front of the net and was clipped by Justin Faulk's shot from the point that got past Holtby — but there wasn't anything cheap about his second one. He parked to the right of Holtby, took a feed from Sebastian Aho past a sliding Matt Niskanen and snapped the puck past the goalie to make it 2-0 with 13:51 left in the second. Foegele had a breakaway late in the second with a chance at the first postseason hat trick in club history, but Holtby stopped him — and then the rookie earned a slashing penalty for whacking the goalie's chest and pads while reaching for the rebound. 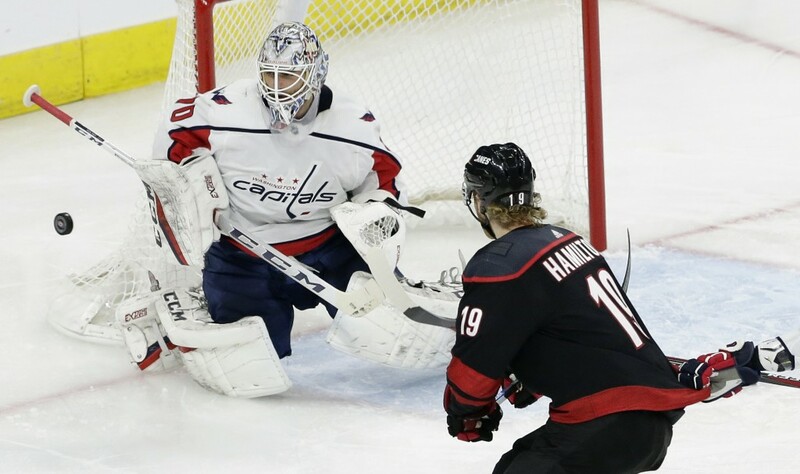 By then, Hamilton had started his scoring binge, ripping a pair of power-play shots past Holtby, with his two insurance goals equaling his previous career playoff total. NOTES: Foegele's only other two-goal game in the NHL came in the third game of the regular season, an 8-5 win over the New York Rangers on Oct. 7. ... The Capitals had just one shot on goal in the second period. ... This was Carolina's first postseason victory since May 14, 2009, when Scott Walker scored in overtime of Game 7 against Boston. Carolina will look to even the series at two games apiece in Game 4 on Thursday night in Raleigh.